The shop, based at the100-acre Coopers Hill Farm just outside the village centre, is now in the capable hands of Ali Humphrey, who has already introduced a raft of new ideas to expand the operation and attract more customers. Ali’s 10-year background in the food industry makes her the perfect person to ensure the business thrives – she owns Claveliis catering company in Bromsgrove, which has more than 200 corporate clients and a great reputation for fresh, homemade and locally sourced food. Coopers Farm Shop is now open every day except Monday, and offers a huge range of tasty items that are either reared or created on the premises, or sourced from other local producers. This is especially important for those who appreciate the traceability of their food and try to cut down on “food miles”. Recent developments include a new deli counter stocking 30 different cheeses (including some local varieties), cooked meats including chorizo and Parma ham, and locally-made pork pies and quiches. There’s also a tempting new chocolate counter where you can pick out your own selection of locally-made treats, and the shop now has specialist sections for gluten-free, dairy-free, and organic products. 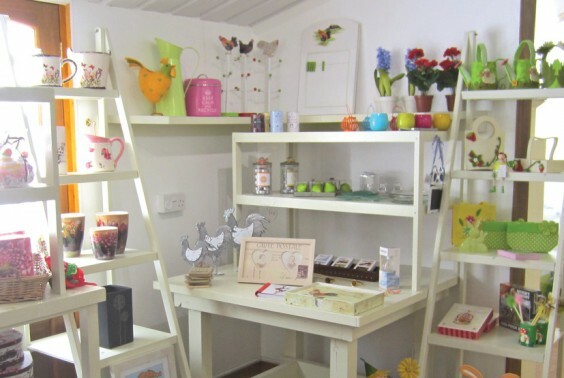 Aside from the food, Coopers Farm Shop boasts a new gift and home ware range, with all sorts of ideas – stylish vases, quality artificial flowers, cake decorating equipment, children’s items, greetings cards and gift bags. One of the most popular things at Coopers has been English longhorn beef, an unusual type of meat from the 60-strong herd of English longhorn cattle which graze many nature reserves across Worcestershire. This is still very much available when in season, the only difference being that the meat is now sold pre-packed for your convenience. Local lamb, mutton, pork, and Adlingtons free-range chicken are also sold. Fans of the shop’s locally-sourced fresh fruit and veg will be pleased to hear that this is still on sale, as is the fresh bread baked on the premises – plus local homemade cakes, jams and preserves and Honeywell honey from just down the road in Alvechurch. Assisted by shop manager Alex Ikari, Ali plans to use her catering experience to introduce a cafe at Coopers, due to open during May. And there are also plans for an online ordering and delivery service for all products. Customers anxious to see the new developments at Coopers will get the chance to explore at a Grand Opening Day on Saturday May 4. There will be pony rides and face painting for the kids, and a BBQ and free drink for the adults!